Every time I get a package from my favorite nail art supply store, Born Pretty Store, I get pretty excited. I am not good at nail art, but that doesn't mean I don't have fun trying. And, quite frankly, I think nail polish should be fun, so as long as I have a good time, that's all that matters to me. 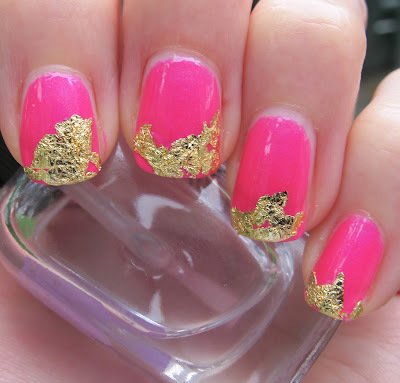 Anyway, today I am sporting some gold foil from Born Pretty Store, along with the lovely hot pink Zoya Lola. This foil comes in both gold and silver. It arrives in little small containers, each with one sheet of foil. You shred the sheet into whatever size foil pieces you desire. For this look, I shredded the foil into very random sizes. I did two coats of Zoya Lola, and then one coat of top coat. 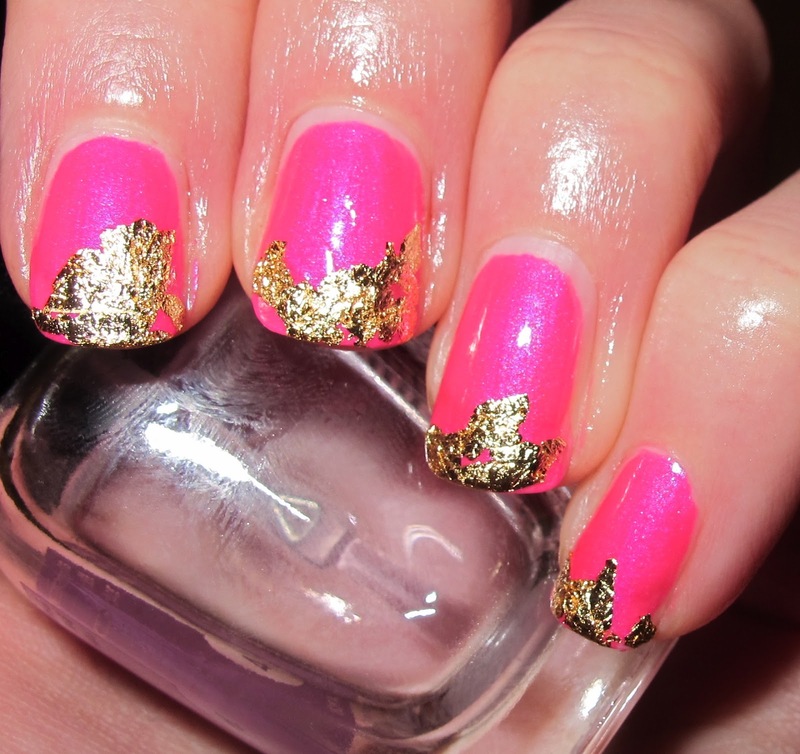 While the top coat was still wet, I placed the tip of my nail in a pile of foil. I finished the look with another coat of top coat. I don't think I even used half of a sheet for this look and they send you six containers of gold foil and six of silver, so for $5.53, you get a supply of foil that will last you a LONG time. I really love this look. It was extremely easy to do and only took a few minutes. I can't wait to try the silver foil. What color polish would you like to see with the silver? Silver foil and dark green polish for a Slytherin mani? If you've been looking for a great foil for nail art, look no further than Born Pretty Store. This foil is easy to use, great value for your money, and overall an excellent product. Remember to use the coupon code ERJ61 at checkout to get 10% off of your Born Pretty Store order! Product sent for review. For more information, please read my Disclosure Policy. 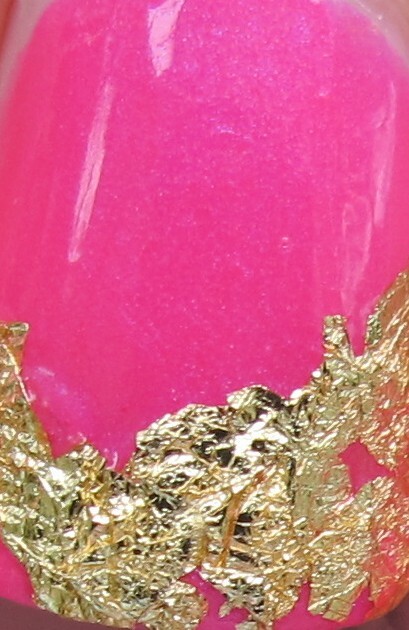 That Zoya is gorgeous! And your right, nail polish should be fun! I love Zoya Lola! It glows! 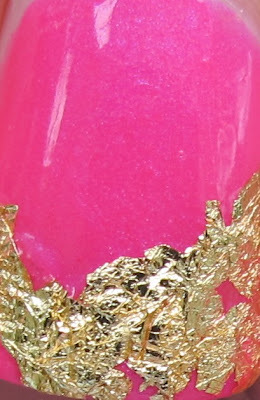 China Glaze Summer Neons Sun-Kissed!! Lynnderella Boy-Girl Party, A Magical Mani! 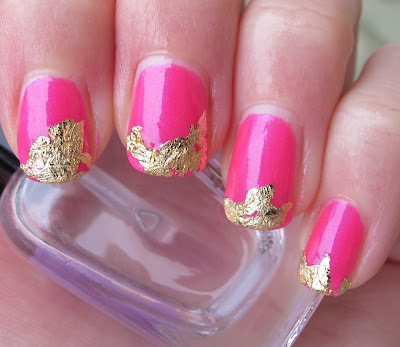 OPI Pure Lacquer Nail Apps in Metallic Waves! !